Join us at the next breakfast installment of our Policy Makers series, featuring Delaware's 46th Attorney General Kathy Jennings. 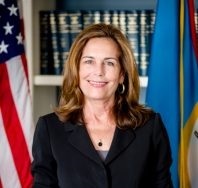 Kathy has served Delaware in many roles, including Delaware State Prosecutor, Chief Deputy Attorney General, and Chief Administration officer of New Castle County. As Delaware’s Attorney General, Kathy Jennings is focused on making Delaware a safer place to live and raise our children, making the justice system fair and equal for everyone, and combating the opioid epidemic. Join us as she shares her vision for Delaware and how she will take us there. Online registration closes on Monday, April 29th at 2:30pm. Additional registration allowed onsite.